We are in shock this morning after discovering a golden egg in the Poultry Orchard. 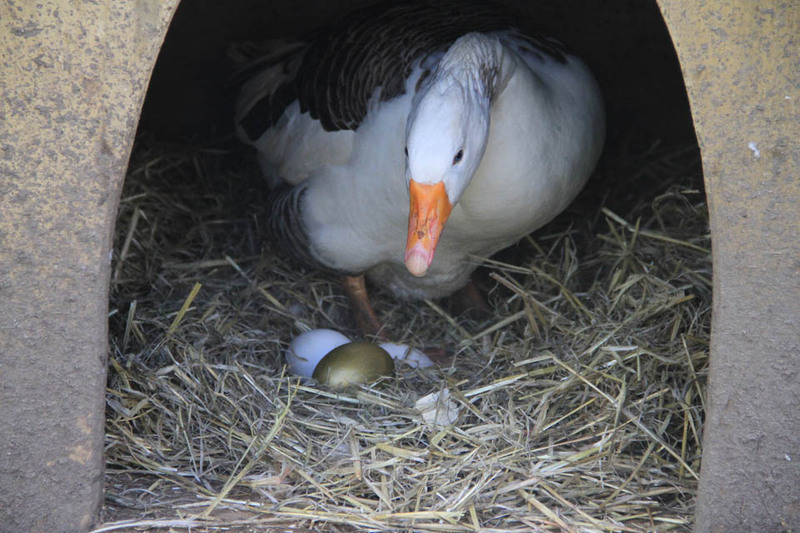 Like something out of Aesop’s Fables, whilst collecting eggs from our rare breed poultry, we discovered one large golden egg underneath one of our nesting geese! “It was such a lovely sunny morning that I first thought it was a trick of the light. When Lucy the goose moved and revealed this golden reflection from underneath her wing I just thought it was the way the sunlight was catching or reflecting on her eggs. However, when she moved from the nest I could not believe my eyes!” – explains Claire Pumfrey, Heligan Estate Manager. Incredibly, nestled amongst the buff coloured goose eggs, was one distinct large golden egg. Similar in size to the other goose eggs and in weight also, it was purely the golden colour that distinguishes it as something different. “Unlike the golden egg in the fable of the Golden Goose, our golden egg isn’t the weight of lead and therefore isn’t solid gold. However, we have conducted some basic tests and conclude that the egg shell is certainly made of gold. Like the others in the clutch, we believe that the egg is fertilised and therefore due to hatch over the Easter holidays.” – explains Claire. We can do no more than sit and wait to see if the resulting gosling is going to differ in colour from its siblings or if Lucy the goose is going to lay any more golden eggs. One thing is for sure, nobody is going to be killing the goose or breaking or selling the eggs like the man in Aesop’s fables. 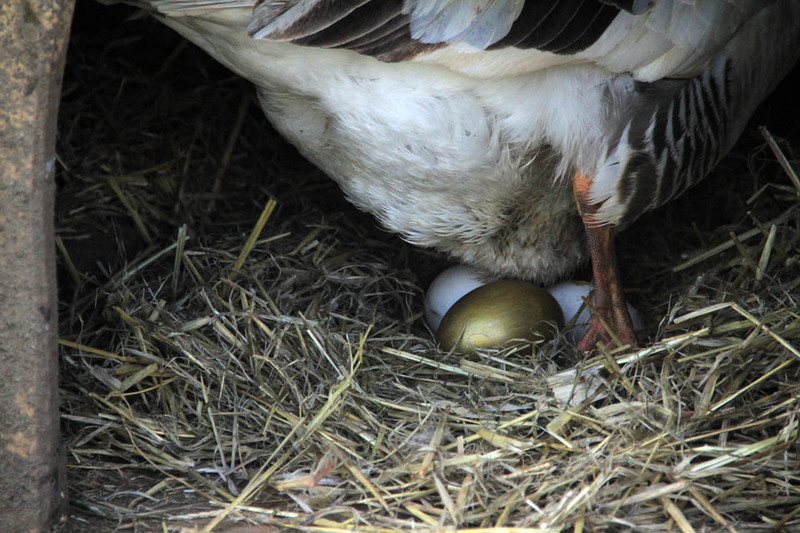 “We have no explanation as to how this could have occurred, as the geese have all benefited the same food and conditions, so how one egg is golden is a complete mystery. We can only think that Aesop’s Fables may have been based on more fact than fiction than originally thought.” – ponders Claire. Please note that this is story is an April Fools!